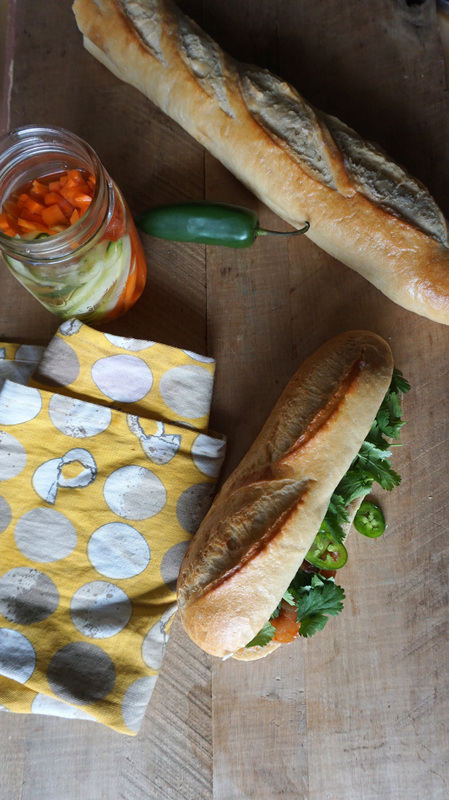 If you aren’t familiar – Bahn Mi is, like, the best sandwich ever. 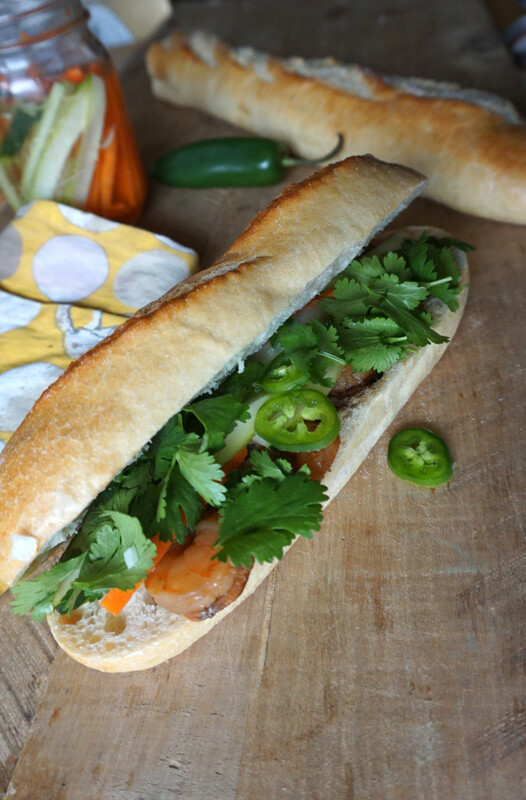 It’s a Vietnamese sandwich that has meat, pickled veggies, jalapenos, cilantro and pate(don’t worry – the pate is optional) on a French baguette. Bahn mis are a Vietnamese and French fusion food that was created when the France had occupancy of Vietnam. 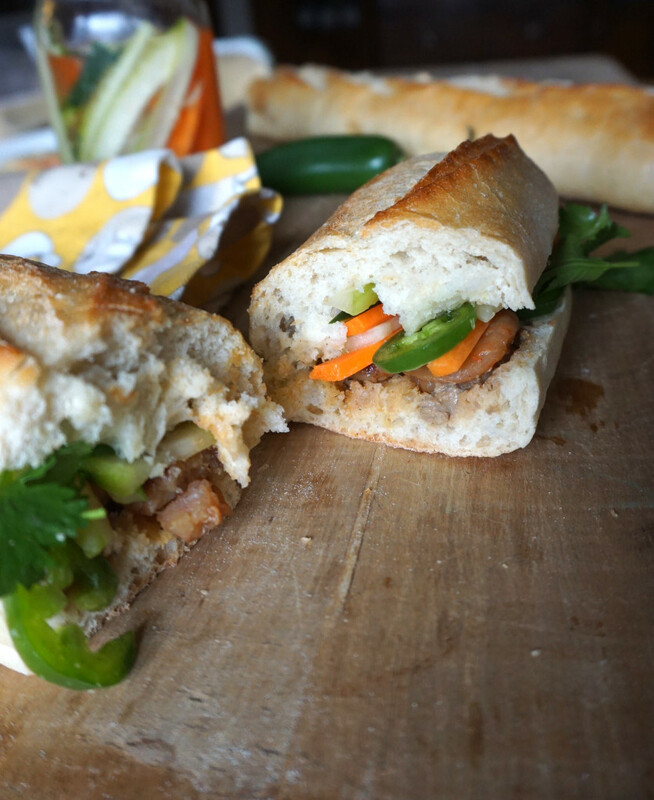 I had never made Bahn Mi, since some of the ingredients seem hard to come by – or at least things I don’t normally have at home. But I decided to try my hand a making liver pate – this was basically just for Dan, since I am NOT a fan of liver. But I don’t mind pate on Bahn Mis. That’s how good they are. Since I was making pate I decided to make some pickled veggies too – those were super easy and the recipe is here. If you’re not down with the pate you can use some mayo instead. I used both because I’m bad. I had some shrimp on hand, and I thought it would be good on the sandwich after marinating for a while in an Asian-y sauce. But you can use whatever meat you like – cold cuts are a common meat for Bahn Mis, which I love. 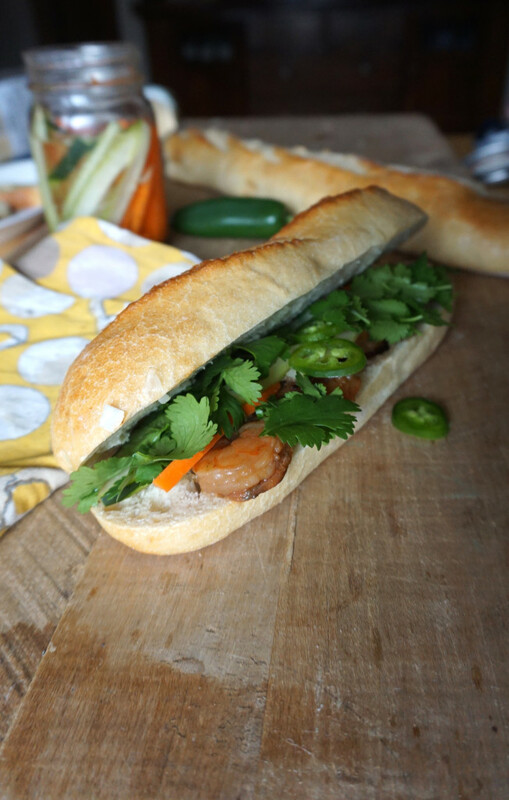 This would also be good with Asian-y meatballs… yum… Okay, now I want all the Bahn Mis. All the ingredients together are a glorious combination. The soft, comforting bread, savory shrimp, spicy peppers, and crisp pickled veggies make my heart and tummy very happy. In Minneapolis you can find these sandwiches fairly cheaply – like $3.99, that’s better than Subway – in taste and price! I usually go to Lu’s Sandwiches or Quang, and those are both great and cheap and they do all of the work for you. But if you don’t live down the street from these places like I do you now have the tools to make this unique and delicious sandwich! Grill shrimp on grill plate until no longer translucent. Slice baguettes in half and warm in oven at 350 for about 5 minutes. Place mayonnaise, pate(if desired), shrimp, pickled vegetables, jalapenos and cilantro onto the baguettes and serve.